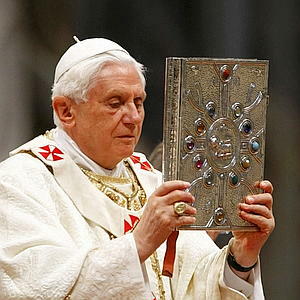 The Sacred Page: Top Vatican Official: Benedict is "The Pope of the Word of God"
Top Vatican Official: Benedict is "The Pope of the Word of God"
Yesterday I wrote extensively about the way Pope Benedict has made highlighting the Word of God proclaimed in Scripture the central focus of his papacy. --Letter to the Bishops of the Catholic Church Concerning the Remission of the Excommunication of the Four Bishops Consecrated by Archbishop Lefebvre. Emphasis added. Perhaps there was a need to refocus attention on the Bible, dusting it off, so to speak, and that is why the 2008 synodal assembly was on the Word of God in the life and mission of the Church. This was the suggestion made by the president of the Pontifical Council for Culture, Cardinal-designate Gianfranco Ravasi, when he presented "Verbum Domini," the postsynodal apostolic exhortation that is a fruit of that assembly. Cardinal Marc Ouellet, prefect of the Congregation for Bishops, as well as Archbishop Nikola Eterović and Monsignor Fortunato Frizza, secretary-general and undersecretary of the synod of bishops, respectively, also participated in the presentation of the document. And [Archbishop Eterović] said that Benedict XVI, in addition to synthesizing the main points of the synod, also enlightened the themes with key elements from his magisterium. "One can conclude," the archbishop stated, "that the Holy Father Benedict XVI can be described as the Pope of the Word of God." There you have it: Pope Benedict is "the Pope of the Word of God." In the meantime, I am still disappointed with the Catholic blogosphere for not doing a better job covering this document. I'll say it again: Verbum Domini is clearly a document of historic proportions. For one thing, it is the first papal document on Scripture released in 57 years. But not only is it an ordinary letter--it is over 200 pages long. Yet the document is barely even getting mentioned in many places. If this were a 200 page document on the Mass on Catholics in political life you better believe Catholic blogs would be carefully picking it over, highlighting the juiciest quotes in post after post. Where are such posts on Verbum Domini? In a historic way the Pope is calling the Catholic faithful to a deeper appreciation of the Word of God in Scripture--it is his "supreme and fundamental priority". Well, it IS a 200 page document. Some of us may still be reading it! Well, I have already written two posts about Verbum Domini, before even finishing it! I just finished reading Verbum Domini yesterday, and I plan to write about the actual document this week. Does not the quote you use to make the point that scripture is the supreme and fundamental priority of the Church and the Pope right now actually refer primarily to leading people to God? The reference to Scripture in this quote is as an attribute to God. Put another way: The statement is saying that leading men and women to God is the supreme and fundamental priority of the Church and the Pope. What God? The God that speaks in the Bible. This also also seems to be the primarily role of the Church throughout history so it is quite fitting that the Pope would reiterate that same goal now. However this isn't to take away from the importance scripture has both in itself and for this goal of leading men and women to God. But, at any rate, it is secondary to the stated goal (which is supreme) and not the goal itself. I don't think that any of your claims rests on reading Scripture as being the supreme and fundamental priority of the Church. It can be secondary with regards to the above stated goal and still need to be (as it surely) made present to the life of the faithful Catholic more deeply.